Stephen Winthrop and M. Jane Williamson make a formidable husband-and-wife team in the fight against amyotrophic lateral sclerosis (ALS). A husband-wife team fights back against ALS with an impassioned commitment to activism, research and each other. He is an analytical thinker. She is an energetic force. Together, Stephen Winthrop and M. Jane Williamson of Wayland, Massachusetts, make a formidable husband-and-wife team in the fight against amyotrophic lateral sclerosis (ALS), the progressive, neuromuscular disease that is slowly robbing Stephen of the use of his muscles. Both Stephen and Jane participate in medical studies known as clinical trials and work hard to encourage other ALS patients to sign up. In collaboration with the clinicians and scientists at the Massachusetts General Hospital ALS Multidisciplinary Clinic, and local and national advocacy groups, Stephen and Jane have created a current of hope for their own family and for the estimated 30,000 people in the United States with ALS. They are fighting a powerful adversary. The disease is slowly but inexorably altering daily life for Stephen and Jane, who, surrounded by their two children and two dogs, work together each day on many small tasks — like tying shoes or cutting food — that have become too difficult for Stephen as his hands and arms lose their strength. ALS, the disease made famous by the Ice Bucket Challenge that swept the nation in 2014, causes progressive deterioration of the nerve cells in the brain and spinal cord that control body movement — the motor neurons. While predicting the progress of the disease for a person with ALS remains challenging, an estimated half of people with ALS die within two years of diagnosis. Stephen is one of a small group of people with a slower-moving disease. That has given Stephen and, by extension, Jane the extra time that many patients with ALS lack to try to move the ball down the field, funding and participating in research as the clock ticks. They are striving to help scientists develop new avenues of treatment, raise ALS awareness locally and nationally, and encourage ALS patients across the country to join them in participating in ALS clinical trials. All the while, they are raising two teenagers, Casey and Hannah, in Wayland. The couple, their family and their friends have jumped in full force with philanthropy and activism. Funding clinical research is their top priority. Both Stephen and Jane participate in medical studies known as clinical trials and work hard to encourage other ALS patients to sign up. Stephen recently received a national “Heroes Living with ALS Award” from the ALS Association. Together, they are supporting the kind of early, cutting-edge research that often goes unfunded by the federal government or large foundations. The Winthrop Family Scholar Fund in ALS Research has contributed $1.2 million to ALS research at Mass General thus far. Stephen (center) and Jane visit with neurologist James D. Berry, MD, MPH. James D. Berry, MD, MPH, co-director of the Mass General ALS Multidisciplinary Clinic and associate director of the Mass General Neurological Clinical Research Institute, is Stephen’s neurologist and one of the dedicated researchers driving ALS clinical research at Mass General. 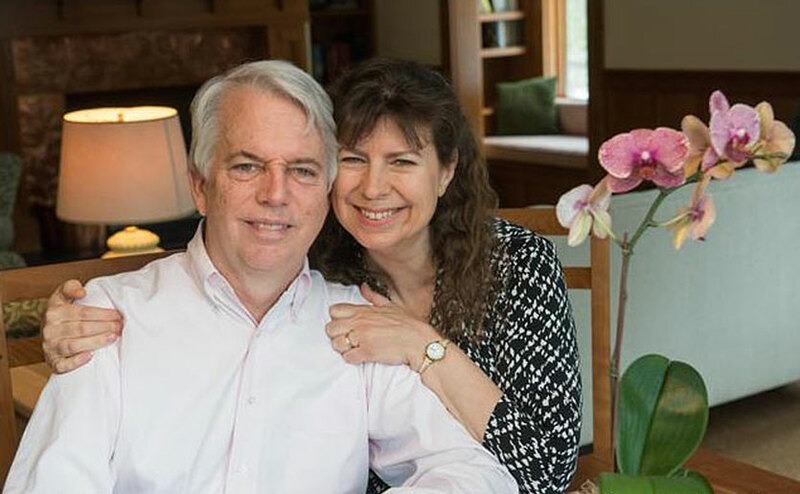 Over time, Stephen and Jane have developed a deep trust in Dr. Berry’s medical care and an avid interest in the cutting-edge ALS research at Mass General. Mass General is one of the most active ALS clinical research centers in the world, leading and collaborating on scores of novel ALS research projects. They decided to help fund ALS research at Mass General to enable Dr. Berry and his colleagues to spend less time applying for grants and more time developing new ALS therapies. “I said, ‘We have to get you back to doing what you’re good at, what you’re trained in,’” Jane recalls. Dr. Berry, along with the ALS team, is helping slow the progression of Stephen’s disease and treating his symptoms. He embraces their participation in ALS research. To give just one example, the Winthrop Family Scholar Fund is supporting a mobile technology project in which patients with ALS wear their mobile phones to track their movements. The project is a collaboration between Dr. Berry and researchers at the Harvard T.H. Chan School of Public Health. A big challenge facing ALS is that there is no objective test to diagnose or track the progression of the disease. Tracking how a patient moves from place to place and how that movement changes over time could provide at least one objective measurement, Dr. Berry says. Dr. Berry is associate director of the Mass General Neurological Clinical Research Institute, Winthrop Family Scholar in ALS Sciences, and co-director of the Mass General ALS Multidisciplinary Clinic. Through participation in research studies at Mass General, Stephen and Jane are also involved in the hunt for ALS biomarkers — substances in blood, urine or spinal fluid, or even information captured through imaging of the brain and spinal cord — that could help doctors diagnose or track the disease. Jane rolls up her sleeve revealing a bandage where she recently gave blood as a “healthy control” in an ALS biomarker study. “By participating in the study I feel so good about being able to help move the research forward,” Jane says. Stephen has participated in trials for three new drugs so far. He is also taking riluzole — until recently the only FDA-approved drug for ALS. That changed in May when the FDA approved the first new drug for ALS in 22 years, edaravone. Stephen plans to consult with Dr. Berry about whether it is a good choice for him. More drugs are being tested. Dr. Berry points out that each drug trial takes researchers a step closer to developing new therapies that will provide more treatment options. Perhaps just as importantly, doctors and researchers are making major strides in understanding the biological mechanisms, clinical features and genetic links that underlie ALS and have made it such a confounding disease to cure. The collaboration between laboratory scientists and physicians is one of the hallmarks of the Mass General ALS Multidisciplinary Clinic, says Merit Cudkowicz, MD, MSc, chair of the Department of Neurology at Mass General. It allows patients direct access to the most advanced treatments through clinical trials. As undergraduates at Harvard College in the late 1970s, Jane and Stephen say they barely looked each other’s way. But they reconnected at their 10-year reunion in 1990, married and continued to work in their chosen fields, she as a lawyer, he as a consultant for non-profit organizations. Two children followed and their team of two became four. In 2011, Stephen began to notice twitches in his left arm — which he ignored. A year passed and his left arm weakened. Many doctors’ visits led to the devastating diagnosis of ALS in 2013. At home, Jane helps Stephen with physical therapy stretches. They broke the news of Stephen’s ALS to their children, ages 12 and 16 at the time, taking advantage of a Mass General Department of Psychiatry program for parents called Parenting At a Challenging Time (PACT). Thinking ahead, they took on an immense challenge: creating a family home where Stephen could be as independent as possible for as long as possible. Their existing multi-level home in Wayland couldn’t be adapted, they decided. Instead, they built a new home nearby, designed from the ground up to accommodate Stephen’s gradual physical changes. They installed wide doorways for wheelchair access, programmable lights and automatic doors. They also planned for lots of light and windows to help prevent falls. The result is a stunning arts and crafts style home that dwells naturally in its wooded setting, while softly masking its functionality. As Stephen’s left arm grew weaker and his right arm showed signs of change, he and Jane observed many small losses. “It’s all those little things you do with an arm without thinking about it,” Jane says. Going forward, their biggest focus is encouraging and educating more people to participate in clinical trials in order to advance the science. “Brushing your teeth,” Stephen says. “Signing a check,” Jane says. “Throwing a ball,” Stephen says. “Clapping at your kid’s school play,” Jane adds thoughtfully. They participated in the original ALS Ice Bucket Challenge in 2014 by video recording Stephen dousing himself with ice water and challenging others to do the same. Stephen has served for the past two years as a national trustee of the ALS Association, becoming board chairman this April. Going forward, their biggest focus is encouraging and educating more people to participate in clinical trials in order to advance the science. “It’s a rare enough disease that it’s hard to get a couple hundred patients to participate,” Stephen says. From left, Hannah, Stephen, Jane and Casey participated in the Walk to Defeat ALS in Boston, in 2016. Their future is navigable but uncertain. They know that their team dynamic will gradually shift as Stephen’s disabilities increase and Jane’s role as caretaker grows. Meanwhile, there are more clinical trials to participate in, more patients to recruit, more researchers to educate, more legislators to lobby, more fundraisers to run. Jane is thankful that Stephen remains mentally sharp and engaged and is likely to stay that way through his illness. “I’m beyond grateful. He will still be my husband,” she says. Even while staying focused on the present, the husband-wife team of Stephen Winthrop and M. Jane Williamson continues to chart a course to the future. Arm in arm with their Mass General clinicians and their many friends in the ALS community, they work toward a time when ALS can be cured or prevented. Please donate to the Winthrop Family Scholar Fund in ALS Research. For more information about ALS research at Mass General, please contact us. Your generosity will help thousands of people whose lives are impacted by ALS.